Made with 80% Cotton and 20% polyester, this is the first time that Strange Music has offered sweatshirts! Krizz Kaliko is silkscreened on front with “dual bird” logo behind it. 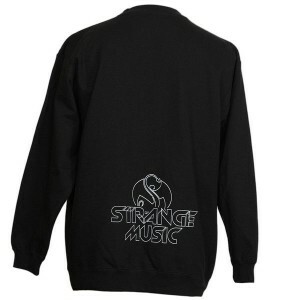 “Strange Music” with logo is on the back, a mark of unsurpassed quality in music and merchandise. Take the “Genius” wherever you go, with this heavyweight sweatshirt that you’ll never want to take off. Available in M, XL, and 3XL. Strange Music offers the finest apparel and merchandise always made with the highest quality fabrics available. With the same standard of excellence that goes into making the music that fans have grown to love, Strange Music pulls no stops in making top-notch merchandise available for wearing to the shows, on the streets, or wherever you are.